I recently found the company Healthy Surprise online randomly and reached out to them to try it out. 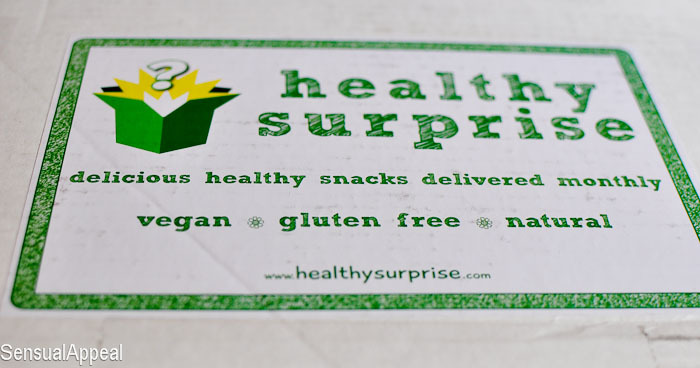 I was very intrigued as there have been many healthy package subscription based programs popping up everywhere but who knows which ones are the best? Truthfully, I think this is it. There was only one draw back to the experience with the Healthy Surprise… I had to wait quite a bit for the package to arrive. The company also messed up and mailed the package to my credit card billing address instead of the shipping address I specified and they put the wrong name on the box. I don’t even know what nationality the name was meant for, I think it might have been Arabic. Who knows. My mom was very confused when she received the package in the suburbs though and thought it was a mistake. She didn’t send it back though thankfully and when I came to the suburbs to visit them, the package was siting there waiting — sure enough, it was meant for me! Now on to the the inside of the package… My, oh my, I felt spoiled. The company seriously has got it going ON! 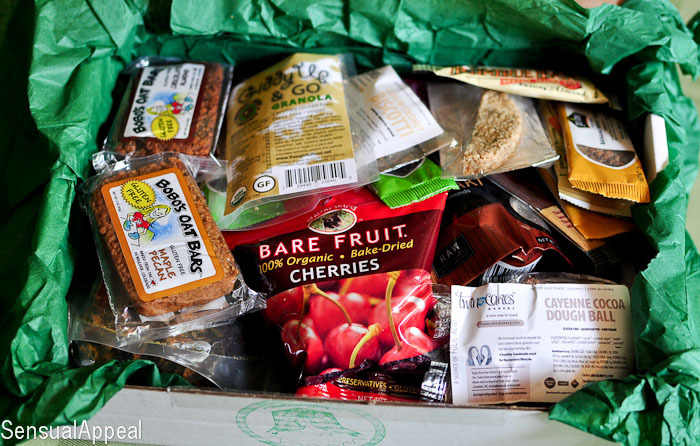 The package was FILLED with interesting and yummy looking snacks, I was SO excited to try them all out. There was just so many to choose from. 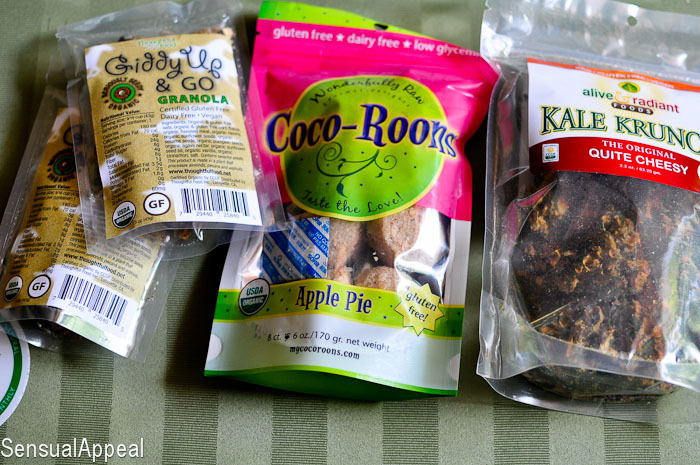 Additionally, all of these snacks were VEGAN and GLUTEN FREE! How amazing! I seriously did not expect to be getting such a full package. So many choices! Everything looked good but truth be told, it all tasted even better than I expected! Well, the stuff that I’ve tried so far anyway, I haven’t gone through all of it yet. Going from the left to right, Stretch Island Fruit Co. has this fruit leather which I expected to taste like a fruit roll-up. It was similar but not quite. It was less sweet but still sweet enough and it definitely tastes like real fruit. 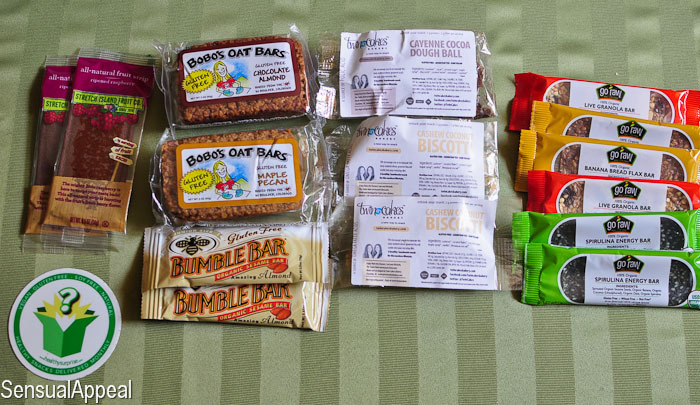 Then, I tried Bobo’s Oat Bars and they are ahh-mazing. Seriously. I sought out the company’s twitter and had to tweet them about how amazing I though they were. Yeah, I’m a dork. But I go crazy coocoo bananas when I eat something that’s good for you, tastes sinful, and is HUGE! Last point. HUGE. These bars are so big and that’s mostly what made me love them even more. Ahh.. okay, this isn’t a review of Bobo’s only so I’ll keep going. I haven’t tried the Bumble Bar sesame bars yet because I’m not a big fan of sesame but once I try them you already know you’ll know if I liked them 🙂 Twin Cakes Bakery had cayenne cocoa dough balls which I didn’t really like because I’m not into the whole thing with combining spicy and chocolate. But their cashew coconut biscoti was amazing. And back in the day, I made a post about stuff I don’t like that others love and one of those things is biscotti. So I didn’t even want to try it originally, I gave them to my mom. She tried it right there and then and said I HAD to try that one – she was right. The texture wasn’t as hard and crumbly as a regular biscotti, which is why I really liked it. Coconut flavor was very strong too, perfect. Then there’s the Go Raw organic bars in three flavors: live granola bar, banana bread flax bar, and spirulina energy bar. I haven’t tried any of these yet either. Bare Fruit organic bake-fried cherries are awesome. 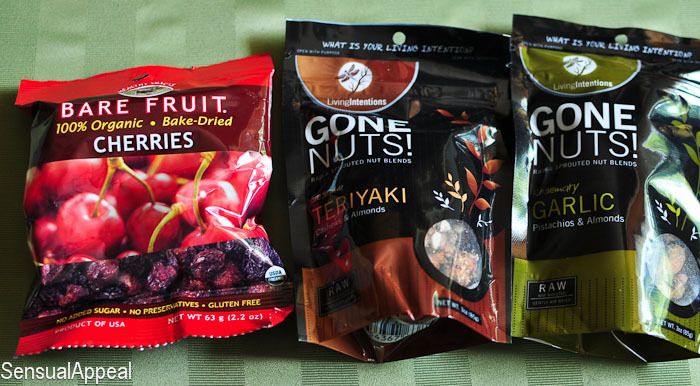 I like dried fruit as long as they don’t contain any added sugars which is the case with these. So they were great in my book! Then I got Gone Nuts two flavors of nuts: Teriyaki Cashews and Almonds and Garlic Pistachios & Almonds. Truthfully, I’m not a big raw nut eater so I wasn’t psyched about these. 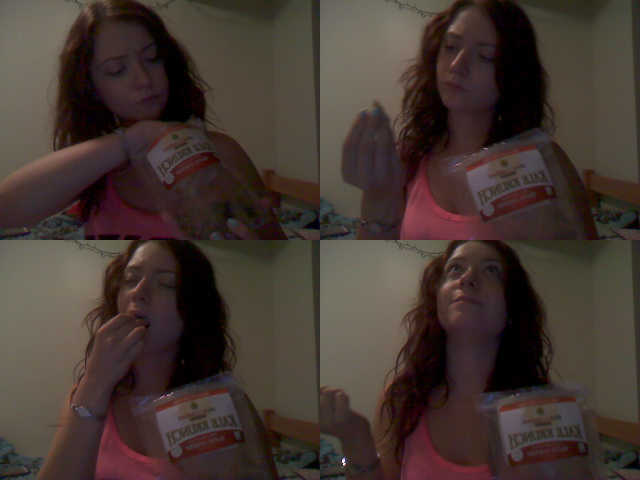 I like nuts when they are incorporated into foods but I never really eat them by themselves as a snack. Maybe I’m weird. Then there’s the Giddy Up & Go Granola which was delicious as granola can be. It’s more chewy than crunchy. The Coco-Roons Apple Pie flavor I went bonkers for – I really liked these! The flavor is so yummy and it doesn’t necessarily taste like apple pie but it sure as hell does taste like coconut which I’ve fallen in love with recently. Delicious! Then there’s the Kale Crunch Quite cheesy Chips which I wasn’t going to eat at first because I was kind of scared but I am SO glad I did — these chips were amazing and surprisingly tasted JUST like cheese! I’m ordering more of these pronto! This is exactly why I love these types of companies. They send you stuff to try so you learn more about yourself while learning about new healthy products that are coming out. This was an awesome package and I got a lot of cool stuff that I really liked and the stuff I wasn’t very much into, my mom liked, so it all worked out perfectly in the end anyway! haha. Starter – $33/month; has 16-20 servings suitable for 1-3 people and there’s a $5 shipping fee. Healthy (most popular choice and also the one I received) – $66/month; has 32-40 servings for 2-6 people and free shipping. Large – $99/month; has 55-60 servings for 3-9 people and free shipping. Super – $333/month; has 200 servings for 10+ people and free shipping. There is no commitment and you can downgrade or cancel your membership at any point in time. If you’re ever not satisfied with the box, you will get a refund thanks to their 100% satisfaction guarantee. The company sends new products each time and sometimes send out single recurring products which are fan favorites. If you would like to purchase a membership, the company has been kind enough to provide you guys with a special discount promo code to receive $5 off your first month! Just enter the code “SENSUALAPPEAL” into check out and you will receive $5 off 🙂 Happy snacking! Oh my gosh that stuff looks good! Looks like you were “spoiled”.. lucky you!! Oh so much of that looks AMAZING! Majorly jealous – I need to start looking into these box delivery ideas! Don’t know if they’re offered in Canada but they sound fab! those eats look so good! and it’s awesome that you got turned on to some new products! Oh my gosh I want to eat those garlic nuts right now!!! Everything looks so great. Love hearing about companies that support healthy foods.